New Brunswick is just one place to live in New Jersey if you want to be near award-winning medical care. A recent study undertaken by the Robert Wood Johnson Foundation reported that people living near stable, highly ranked hospital systems in New Jersey benefit from longer life expectancies. It showed that residents of Trenton averaged around 73 years, while those in Princeton Junction (close to Penn Medicine at Princeton Health and other top hospitals) averaged around 87. That's a huge difference of 14 years. New Jersey has over 100 hospitals, fifteen of which made U.S. News and World Report’s list of the Best Hospitals in New Jersey. With so many excellent facilities in the Garden State, active adult homeowners can easily find a 55+ community conveniently close top medical care. These two cities are about half an hour apart from one another, and the top two hospitals in the state are close by. Morristown Medical Center is nationally ranked in both cardiology/heart surgery and gastroenterology/GI surgery. It is also high-performing in five other adult specialties, conditions, and procedures. Accolades include a five-star rating from the Center for Medicare and Medicaid Services, and an “A” grade for safety from Leapfrog. Founded in 1888, Hackensack University Medical Center is rated high performing in seven different adult specialties, procedures, and conditions. It is part of Hackensack Meridian Health and includes 10 community hospitals, two rehab hospitals, the Heart and Vascular Hospital, Sanzari Women's Hospital, and John Theurer Cancer Center. Less than 20 minutes from Morristown, the gated community at Fox Hills has 672 resale condo homes in a beautiful neighborhood close to stunning parklands, major highways, and shopping centers. The property has a 26,000 square-foot clubhouse, indoor and outdoor pools, and tennis. Condos range from 820 to 2,935 square feet and come with garages. There is a nominal homeowners’ association fee. Winthrop Court is just 13 miles from Hackensack. This gated active adult community of 270 resale condos offers upscale, low-maintenance living with 1,485 to 2,139 square-foot, two bedroom/two bathroom condos. Features include a parking garage, large master suites, and granite countertops. Winthrop Court’s Royal Club includes a fitness center, pool, sauna, lounge, and bar. Active adults living in Central Jersey can take advantage of excellent medical care at two area facilities. Robert Wood Johnson in New Brunswick is a Level 1 Trauma Center and an academic medical center. It has many Centers of Excellence, including orthopedics, women’s care, cardiovascular, stroke, bariatric surgery, and neuroscience. Hunterdon Medical Center in Flemington was ranked high performing in geriatrics and nephrology. It is part of Hunterdon Healthcare, which has over 25 facilities. Hunterdon Regional Cancer Center was awarded The Commission on Cancer’s 2017 Outstanding Achievement Award. Gateway at Royce Brook is very close to both of the top Central and North Central New Jersey hospitals. It offers 296 single family new and resale homes in a well-appointed development. Construction began in 2014 by Premier Development, the property has a state-of-the-art clubhouse, outdoor pool, tennis, fitness center, library, and more. The large homes are sized from 2,374 to 2,975 square feet, with three beds, three or more baths, and attached two-car garages. It is close to a multitude of shopping opportunities and Newark Airport. Located in scenic Hunterdon County, Gateway at Royce Brook is a new active adult community of 246 single family and attached new homes built by Pulte Homes. The townhomes range from 1,370 to 1,510 square feet, while the single families are from 1,674 to 2,900 square feet. The many different models offer two to five bedrooms, two to four bathrooms, and one or two garages. Plans for a clubhouse, fitness center, outdoor pool, trails, and sports courts are underway. Virtua Voorhees is a newer hospital, with all private rooms and high rankings in COPD, colon cancer surgery, heart, hip replacement, and knee replacement. It was also chosen by Best Master of Science in Nursing as one of the "25 Most Amazing Modern Hospitals in the World." MD Anderson Cancer Center at Cooper Hospital is ranked by U.S. News & World Report as the top hospital for cancer in the country. It is part of Cooper University Health Care, which is associated with Cooper Medical School of Rowan University. 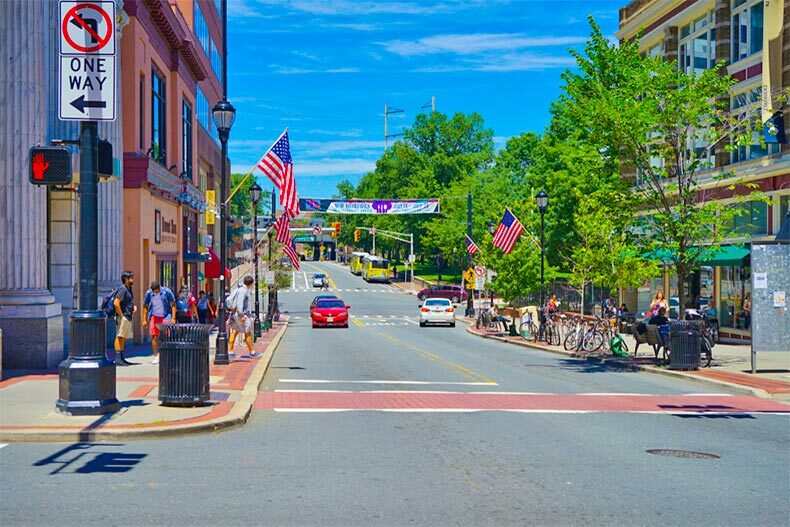 Located in desirable Voorhees, Centennial Mill is an active adult community with 401 attached and single-family resale homes. Construction was completed in 2007 by Del Webb. Townhome sizes start at 1,643 square feet with one bedroom and bath, and the largest single family is 3,065 square feet, with three bedrooms and two-and-a-half baths. All come with two car garages. The property includes an outdoor pool, tennis, a putting green, trails, a community center with a clubhouse, and a sports center with an indoor pool and fitness center. Centennial Mill also has over 25 social clubs for its residents. Active adults looking for modern conveniences, great shopping, and low-maintenance living will find sanctuary at The Plaza Grande at Garden State Park. This newer community of 608 condos was built from 2005 to 2013 by TSV and D.R. Horton. There are a total of 12 models available, sized from 721 square feet up to 2,370 square feet. Most have two beds and two or more baths, each building has first-floor garage parking. Homeowners can spend quality time at the 18,500 square-foot fitness center, indoor pool, and enjoy other swank amenities. Plaza Grande is on Route 70, close to two large shopping malls, restaurants, and just over the bridges from Philadelphia.